What kind of in-season experience can I expect? Sleeper fantasy football leagues provide a vastly improved in-season experience compared with existing platforms. Chat and smack talk are the focal point of the experience and we will have animated match-up screens and custom skins that you can apply to impact your opponents experience. For example, every time you score a touchdown a dump truck might fly in and unload a pile of doodoo on your opponents mobile screen and send them a push notification about it! In addition, we will have live scores, statistics, play-by-plays, trending players and more to provide you with up to the second information relevant for your fantasy leagues. Over time we will keep adding new and fun features to make game day much more fun and lively. 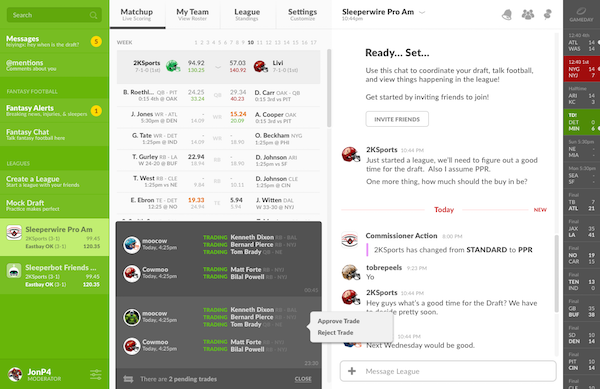 Sleeper will change how you enjoy fantasy sports with friends.